Going to try quasi live journaling our weekend adventures and the Wildrose AGM. Truthfully a lot of it may end up being after things happen - depending on how much socializing we do, battery power on the laptop and of course internet access. 7:00 AM - Thought I could sleep in a bit today; had to settle for just 30 minutes extra sleep as the dogs decided to break into their food bin and help themselves to breakfast. 9:00 AM - Blue and Stewie are packed up and Cory is taking them to their sitter for weekend. Thanks Jade at Where's You're Sit. 9:30 AM - Cory returns and loads up Duke, who is currently an Alberta Bulldog Rescue, and he is on his way to a foster volunteer. Time for me to get dressed and go for my pedicure / manicure appointment. 1:30 PM We have been on road for about 1.5 hours now, just passed through Red Deer. I did a telephone interview with James Wood from the Calgary Herald. He will be attending and covering the AGM. You can follow him on Twitter. 3:15 PM Checked in at the Mayfair Inns & Suites in Edmonton. Get ready for evenings events. 5:15 PM We had supper in the restaurant of hotel. I'm not a huge fan of buffets, but this one was quite exceptional. Awesome food. Highly recommend it. 6:30 PM We checked in with the Wildrose registration desk and received our AGM packages. 9:00 AM Doug Main is MC'ing the morning events. We start out hearing from the various candidates for Executive Committee positions. Provincial (Zone) Director candidates all speak of connecting with members, strengthening CA's and grow strong base in preparation for 2016 General Election. Excellent candidates and tough choices in all the various divisions around Alberta. 10:25 AM After a coffee break we will now hear from the candidates for key Executive Committee positions. Confirmed there are 700 members in attendance. Rob Anderson makes fun of bizarre rumors that have been floating around. You can also watch live stream of Danielle's keynote speech today. The PC’s held their AGM last weekend and there were a few jabs sent their way on Twitter; from the usual suspects and yes, okay I was one of them. On November 23 / 24 the Wildrose will be having their AGM and I fully expect return fire; times three. Likely very little of it will pierce me. Some might smart a bit if they come from PC friends like Calgary Rants or Enlightened Savage. Later we will get together for drinks with Alberta Altruist and others to commiserate on how every party has similar challenges to deal with. Typically I will point out how the Wildrose has been able to differentiate itself from some of the other parties; in particular when it comes to listening to the grassroots and avoiding top-down decision making. Alas, it would seem the days of having those bragging rights are dwindling. My last role with the Wildrose was being an elected (volunteer) Provincial Director (PD for short or some call them Zone Directors) from June 2011 to June 2012 when I stepped down. During that time the Executive Committee (EC) very seldom met (despite it being an election year) and on occasion the Provincial Directors were left off the meeting agenda. This made it very challenging to bring ideas forward that came from the Constituency Associations (CA) we represented and in turn from the members. One thing the PD’s did get approved at the EC level was for the party to cut back its’ monthly fundraising letters to every second month. That way the CA’s could focus on their fundraising in the alternate months. That directive was given to the Executive Director, Shayne Saskiw in September 2011. It was never carried out. More often than not though it would be the President bringing forward motions with the notion that it was a foregone conclusion we would pass them. With only a handful of individuals willing to ask questions or speak and vote against many of them, things generally got passed with little resistance. When this happens time and time again one begins to feel you are there simply to rubber stamp someone else’s agenda; but you never really know who “they” are. Last Saturday my phone started ringing and emails came in about a motion apparently passed just last Wednesday (Nov 7) by the EC; that the vast majority of our members likely won’t be happy with, in respect to an office move. The Party has been in very expensive downtown space since January 2010. In my opinion it was the worst possible location and one of the worst financial decisions we ever made. It’s not wheelchair accessible, parking is expensive, the layout isn’t conducive to any sort of confidential business meeting, it’s so cramped volunteers are elbow to elbow, it’s cumbersome for media to get their equipment in and there is no room to set up for interviews. And to top it off we signed a lease that would expire March 2012. I remember saying at the time; “we will be in another election then.” And we were; so since then we have continued month-to-month paying the high downtown prices. The Party does need to move; there is no doubt in my mind about that. This was to have been a priority as soon as the election was over. This was discussed at the December 2011 and February 2012 meetings of the EC. There was resounding support to find a more affordable and accessible location in Calgary with free parking for our volunteers. In fact in those same discussions we all agreed that when looking for our new Executive Director, (if Shayne were to be elected) that they would either be from the Calgary area or be willing to relocate to Calgary. As I understand it a similar discussion occurred at the August 7, 2012 meeting; that the new location must be in Calgary. The EC didn’t want to deal with the blow-back they would get from CA’s and members if they considered another city. Indeed the last time I did an analysis (early 2010), more than 80% of our membership base lived south of Red Deer and 75% of fundraising was coming from southern Alberta; with the vast bulk of that from Calgary. Back to the motion passed. There seems to be two versions of what was passed going around. Even the board members I spoke to are confused as to what the motion said exactly. Version one is that there will be a report brought back to the EC on November 20th with options as to available space with a focus on finding space in Edmonton. The second version is that by November 20th they will sign a lease for a specific space in Edmonton. Regardless of the wording, clearly the intent is to move the office to Edmonton. This was something that I had discussed with current ED, Jonathon Wescott just a couple of weeks ago when we sat down for a coffee. At that time he said it didn’t matter one way or the other to him where the office was. However he then proceeded to give me numerous arguments as to why it would be better in Edmonton. Some of the things he cited were; “Staffing would be easier”, they wouldn’t “lose staff to the oil and gas sector.” “They could pay staff less”. “Space is generally cheaper in Edmonton”. “It would be closer to the Leg”. “It would help deter the ‘Calgary Party’ labeling”. And on and on. People seem to have either very short memories or conveniently forget our failures. Wildrose has tried twice to have an Edmonton office and failed miserably both times. Volunteers don’t show up or if they hear certain other people are involved they refuse to help. There are more ‘factions’ within the Edmonton Wildrose supporters than there are political parties in the whole province. They also seem to think having an office there will somehow draw support. No – it doesn’t happen that way. Our office was originally in Red Deer, that didn’t change where our members came from. When we did move it to Calgary it was because the party was all but broke and someone offered free office space. Additionally, it was operated for over three years by volunteers. Some (mostly the MLAs) argue that being closer to the Legislature will make it easier for MLAs or legislative staff to attend at the office. If you were to ask me that is EXACTLY the reason it shouldn’t be in Edmonton. The notion of is divvying their time between legislative and party activity is what will get us into very hot water. Directing any legislative staff or resources to partisan activity; even just the perception of it, would be a goldmine of material for the other parties to attack us on. Many don’t seem to grasp the concept of the Board of Directors being responsible for the “operational” side of the Party and the Leader and Caucus being responsible for the “political and Legislative” side. The two work alongside one another, but the EC doesn’t tell Caucus how to run government (opposition in this case) and Caucus doesn’t tell the EC how to operate the Party. Sadly I think these lines have been drastically blurred. Others also try to make a case about “there are too many Calgarians running for positions on the EC”. Well, yes there are a lot because this is where our largest base of members, supporters, volunteers and donors happen to be. If Edmonton wants greater representation on the board all they need to do is RUN! Again, moving the office there won’t magically make people more interested in doing a completely thankless volunteer job. I’ve suggested it many times before, if Edmonton is so gung-ho to have an office (or Red Deer or the Hat or anywhere else) they should start it the same way we started in Calgary. Get your donated space, get volunteers to man it; then show us if you have an increase in support, membership, volunteers and donations. If your CA’s can’t do that, having 3 or 4 paid people in office cubicles aren’t going to get it done either. After people started contacting me, I reached out to and spoke with several of the current board members. I wanted to get a handle on why the change in direction and why there also seems to be a rush to get this done just weeks prior to our electing a new board. So I posed some questions to a few EC members (both for and against the move to Edmonton), CA presidents and a couple members. I’m only posting the responses that were made by two or more individuals. Why did this have to be decided now, right before a new EC is elected? What do you think is the true motivation for moving the office Edmonton? I will restate I do support the office moving and believe the EC should have dealt with it six months ago. Some will say; “oh but there wasn’t an ED in place six months ago.” My response to that is it’s not the EDs decision to make. ED’s operate under the governance and guidance of the EC. Certainly locating space is something they could task the ED with, however in the absence of one they could delegate it to someone else. Or as the EC in 2010 did, they could engage the services of commercial rental brokerage. Heck they could even send out a Tweet and do some crowd-sourcing. It leave one to wonder why there is now such a rush to get this done? Especially when it seems the two main EC members championing it are Paul Collins and Rob Ladouceur, neither of whom are running for their positions again. Remember Rob L is the one who wrote the clause enabling them to prevent anyone from running for the EC for any reason. And it was Paul Collins (in the comments of that same posting) who referred to vocal Wildrose, grassroots’ supporters as “clowns”. They know full well a new board will be in place by month’s end. Indeed the timing of a November 20th deadline, just three days prior the AGM is very suspect. Is this their way of leaving a legacy of their time served? Now, back to my opening remarks about listening to the grassroots and avoiding top-down decision making. Is moving the office part of Caucus business? No. Having a party office and its location are an operational function which the EC is responsible for. Is moving the office at the ED’s request or to suit where he lives a good idea? Again, likely not. Are we going to move the office and hire new staff each time we have a new ED? Keeping in mind Wescott is our fourth Executive Director in less than three years. Is moving the office a decision for the entire membership to be making? I think not, it would be a bit cumbersome to garner input from 25,000 people. Is it something that perhaps the EC could elicit feedback from CA’s on through their PD’s? Absolutely. It would make great strides towards building those bridges and they do after all represent the members. One of the concerns I hear repeatedly coming out of Edmonton is access to EC minutes. Currently the only way to get them is for a CA president to request in writing to attend personally at the office to view them. Previously our practice was to email them out – you know part of being "open and transparent." So it’s no wonder CA’s who can’t attend personally at the office feel put out by the Party. If we want to be able to keep holding our heads high and honestly say “we aren’t like other parties”; we had better make sure we elect an EC at our AGM who will abide by our constitution and listened to the members and our CA’s who are also duly elected by the members. Members please take the time to get to know all the candidates who are running. You can find a list and more information on each of them by clicking here. Update: I've received a copy of Jonathon Wescotts' "Office Relocation Report". However, I will need to remove some information; so will be posting a redacted version shortly. Report is now posted under a separate tab at top of blog. Here is quick link to it. Interesting twitter discussion on this post. I've always have always been drawn to graveyards. I'm not sure why this is. I know most people avoid them and some even feel uncomfortable in them. I remember being genuinely surprised when Cory told me he too liked them. Since then we have visited many together and even had some of our wedding photos taken at the Union and Burnsland Cemeteries in Calgary. We love strolling through them, reading the names and wonder what their lives might have been like. We can only wonder as we never knew these people and I guess it's our way of remember those who came before us. That's what Remembrance Day is about; paying tribute to those who made sacrifices for all of us, whether you knew them or not. As generations pass I think it will become harder and harder for people to remember. As those who survived the major wars pass away, so will some of their stories. Grandchildren, great-grandchildren and so on will be further and further removed from the memories of those directly involved in war. Last week my son was award three scholarships and bursaries from Mount Royal University. One of them was the "Flight Sergeant George Quist Hansen Military Memorial Bursary". This piqued my interest to learn more about George Hansen. What I found was very limited, but does include two things of (ironically) personal interest. George died either April 27 or 28, 1944 (depending on the source) during WWII. He was 28 years old and he is buried at Schoonselhof Cemetery in Belgium. He was a gunner in the Royal Canadian Air Force. He was in the 431 Squadron and the serial number of his plane was MZ536. This is will be of interest to my son, since his grandfather on his fathers' side was also a gunner in the RCAF. It makes one ponder if they ever crossed paths. Given it was a mission on the evening of April 27 that explains why there are the two dates of death. From another site I discovered he had a wife and was from Standard, Alberta. Since I grew up in the area and attended High School in Standard - it has me wondering if I went to school with one of his descendants. There is so much we don't know about George Hansen. Where was he born? Did he have children? What kind of man was he? On this day though, I we don't need answers to those questions. On this day all we need do is remember that he gave the ultimate sacrifice for all of us. Him and many, many more that we know little of. 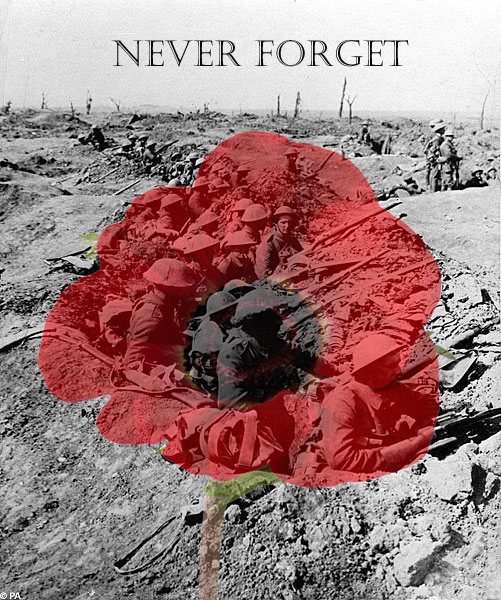 It is our duty now to remember what they stood for. What they all believed in and died for. "I DO NOT KNOW YOUR NAME"
I do not know from where you came, but I know you died. ".....the Alberta Alliance is a completely separate entity from the Wildrose Party..."
For bonus points, is the statement true or false? I missed listening to the Alberta Question Period on Monday, but have since read the Hansard. Alberta's reputation has been damaged. Our election financingprocess looks like it's been broken by abuse. We have asked theChief Electoral Officer to investigate the enormous and potentiallyillegal contribution from a single source to the government party.But even if the contribution is technically legal through a loopholein the existing law, it means the law is deeply flawed. When willthe government fix it? particular?The hon. President of Treasury Board. Electoral Officer is an officer of this Legislative Assembly, andwe respect that on this side of the House a great deal. We believethat he is discharging his duties under the legislation that he has infront of him, and he's doing a good job doing that. Of course, theparty opposite doesn't really want to talk about its own history inthis regard in terms of that sort of thing. Perhaps in the 2004election campaign, when one individual bankrolled 75 per cent oftheir entire political contributions for that campaign, one mustwonder . . .
Mr. Anderson: Point of order, Mr. Speaker. The hon. Leader of the Opposition for her first supplemental. correcting the record.Continuing on, Mr. Speaker, given that the government's vagueanswers and insistence that everything is okay have done nothingto restore the public's confidence, surely the Premier must agreethat the shell game that is damaging our public's trust has no placein our democracy. across the way. This party has followed all of the rules that are inplace. We will co-operate with the Chief Electoral Officer on thismatter to a T. But, again, somewhat hypocritical of the partyacross the way when in the 2007 by-election the same individualwho bankrolled 75 per cent of their 2004 election campaign bankrolled 99.7 per cent of that party's contributions. Incredible. It prompted a number of Wildrose supporters to tweet things like "the #wrp (Wildrose) didn't exist in 2004" or "Doug Horner needs to bone up on his Alberta political history #wrp not a party until Jan 2008"
"#wrp is diff legal entity than Alliance" and "Katz can donate to whomever he wants but not if it is illegal. Nobody has donated 400G to the Wildrose Party-that is incorrect." The multiple donations of $30,000.00 from the Thorsteinson's (2004-2008) and the ones from Katz Group, family and business associates can be seen as very similar situations. One case the investigation was started based on a written request; the other, written requests seemed to either have been ignored or no action is being taken. One case were several cheques from many individuals and businesses; the other is reportedly one cheque for up as many as 10 different individuals and business entities. One case Elections Alberta requested (and got) RCMP involvement (via the Solicitor General) so they could compel donors (those who got the receipts) to provide PROOF it was in fact their money they contributed. (Section 34(1) of Election Finance Act.) ; the other appears will never even get that far. It is absolutely appalling that the PC's of today won't open their books to the scrutiny that they expected, they asked for and they received from the Alberta Alliance. Alberta's chief electoral officer is launching an investigation into donations made to the Progressive Conservative party by the owner of the Edmonton Oilers, Daryl Katz. "The allegations are that the thresholds of $30,000 have been exceeded by one individual and the election filings that we've received in our office from the political parties indicate that those contributions were receipted for individuals associated with this one person," said Elections Alberta spokesman Drew Westwater. "We've determined that there's enough issues and concerns around the source of the donations that have been made to the party that we will launch an investigation and look into the facts of the matter to see if the allegations are true or not." Click on link to read entire article. This week Elections Alberta publicized election financials for all parties from this year's election. Since then the top story has been the amount of money donated by the Katz Group, the family and associates. Those names come from this Globe and Mail article and the figures from the Elections Alberta report. But a source close to the campaign told The Globe and Mail that Mr. Katz provided a cheque for $430,000 to the PCs, a donation that was broken up into smaller pieces. If such a cheque existed, what happened to the remaining $130,000.00? Was it returned to Katz Group? Was it "allocated" to other donors? Apparently this donation came in the latter part of the election; which would explain why the Katz name didn't show up on the list the PC's released. Now they add up to more than $ 130,000.00 but it gave me a starting point to see if I could find any connection to the Katz Group. Brad Gilewich Professional Corp and Brad Gilewich: According to LinkedIn Brad is a Partner with Price Waterhouse Coopers. Given PWC are the auditors for Katz Group I highly doubt there would be anything untoward going on here. Right? Durstling Family Trust: Simple Google search reveals Darren Durstling as one of the trustees. Bradley S.R. Clough, along with Darren Durstling and Laurel Durstling, as trustees of the Durstling Family Trust, paid cash ($1,856,630) for a 6,180-square-foot home with pool on the north side of Mummy Mountain Park in Paradise Valley. Darren Durstling is vice president of development and one of three principals of WAM Development Group of Edmonton, Aberta. WAM Development Group, why does that sound familiar? Oh, they too were a large contributor to the PC's this election in the amount of $ 25,000.00. Ironically enough they were also in the news earlier this year. The Katz Group will work with Edmonton-based WAM Development Group to develop the lands adjacent to the proposed site of the downtown arena, the Oilers owner announced Friday. Scott Family Trust: Can't seem to find anything on this. Anything that even comes close isn't located in Alberta. Candor Investments: Apparently are located in Calgary, but they don't have a website. Nor could I find any information on the principals. SPC Investments Ltd: I could only find one document or reference to this exact name and it’s on a list of businesses whose corporate registrations had been cancelled in 2003. People and companies writing individual cheques, within election limits isn’t an issue. Unfortunately a company or an individual can also give money to family, friends, co-workers, etc. and they in turn can give it as a donation in their own name. Again nothing wrong with this, so long as they have reported the income as required by CRA given their individual situation. However, what the Globe report was that it was “one” cheque. Which begs the question; were all the funds truly from those who ultimately received the tax receipts? If not – that’s fraud. Section 34 states that parties cannot “solicit or knowingly accept any contribution” that doesn’t actually come from the contributor’s pocket. If it turns out to be one cheque I already know what Premier Redford’s response is going to be. When a party, constituency association or a candidate gets a cheque that exceeds the limits it is their responsibility to return the cheque, explain the limitations and advise them they cannot give money on “behalf” of someone else. Let’s look at this from the perspective of a donor not familiar with the laws. Joe Blow says to his friends: “I’ve had a successful year and I want to share that with you. I’m going to make a large donation to my favorite political party and some will be on your behalf." Joe sends off the big cheque only to have it returned with an explanation of limitations and rules. Now ordinary, honest Joe citizen will accept that and write a new cheque contributing only what he is legally allowed. But we also have Joe citizens who are not so honest or ones that have been “coached” by not so honest political parties. His honest friends will realize at that point there will be a need to explain where the money came from and there will be tax ramifications; they will tell him to take a hike. Others may not think that far ahead or not care and partake in the scheme. As far as the multiple Katz donations from family and work associates, no one knows what happened except for those inside the PC Party. Premier Redford points to the financial report and says it’s all open and transparent. Well, no it isn’t. Until we see the paper trail that only the PC’s have access to we will not know exactly what transpired. Discovered another donor who has done business directly with Mr. Katz. EDMONTON, June 19, 2012 /CNW/ - Two new chapters in the Alberta aviation story will be turned June 20, with the official introduction of a Canadian aircraft-ownership innovation and a newly constructed $26 million, four-bay hangar and office complex at the Edmonton International Airport. Aurora Jet Partners is the innovation. It has been created by Morningstar Partners of Edmonton and Opus Aviation ofVancouver, companies founded and operated by Don Wheaton, Kim Ward, Daryl Katz and The Ledcor Group. Don Wheaton Ltd. contributed $ 25,000.00 to the PC party. It should be noted that some of these contributors also donated to other political parties in smaller amounts. Additionally, their ties to the Katz Group don't necessarily mean that they have anything to do with what is surely going to turn into an investigation by Elections Alberta. Elections Alberta spokesman Drew Westwater said his office will “probably” launch an investigation into the April election campaign donations made to the PC party by Katz, his family and associates. The Globe and Mail today has confirmed many of the links to Katz that I've mentioned in this blog entry. All of $430,000 donation to Alberta PC's now linked to Katz associates. 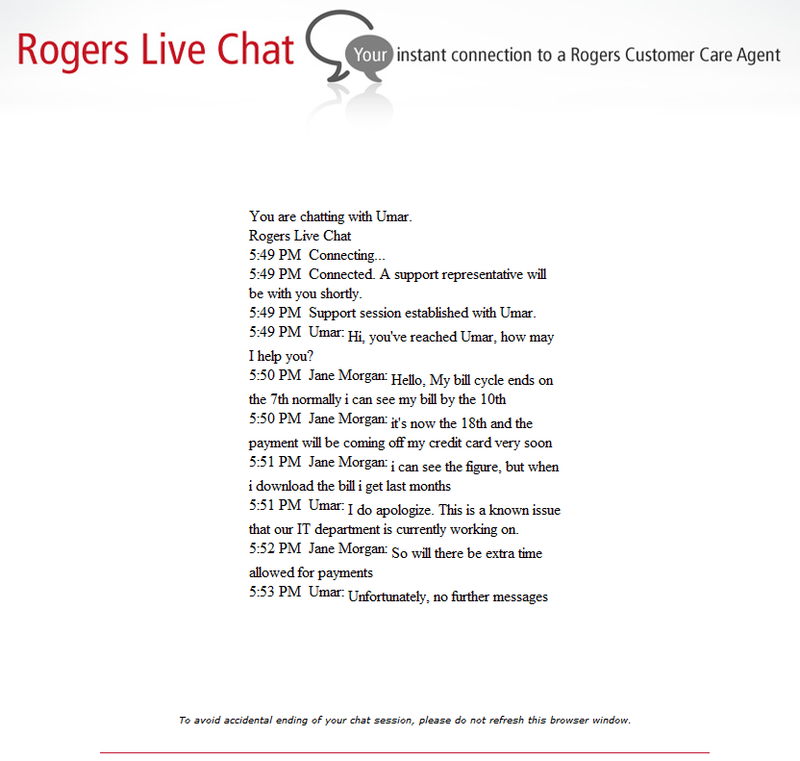 This is an actual chat log from Rogers. After his last message, the box for me to type messages in closed. This might be funny if it weren't a true story. You can click on image to enlarge. After my previous blog posting, I had hoped not to blog again about the Wildrose Party or at least not in a critical fashion. I've registered for the AGM, booked our hotel room and booked a dog sitter. Despite some misgivings I do believe it's more important than ever to attend. We won't be passing any policy or constitutional amendments, however we will be electing a new provincial board and the importance of that can't be ignored. In my previous post I mentioned that I felt the party was "off" on their dates for the deadline for nominations. Specifically the constitution says it is 65 days prior to the AGM. By my calculations that date would be September 19; yet the party had a deadline of September 21. In that same post Paul Collins (President of the Party) left a comment referring to (presumably) me as immature and a "clown". He also suggested that I should pick up the phone. I did take him up on this advice. Since I didn't have a phone number for Paul, I called Jonathon Wescott, Executive Director; who falls under the direct supervision of the Board and of course also communicates back to the board. My questions for Jonathon were simply; "Why the mix up on the dates?" And; "If they were sticking to the 21st deadline was it going to leave them enough time to meet the next deadline?" (That being notice to members of the names of those running for the board positions.) Jonathon and I played telephone tag for a few days and my last attempt was on a Thursday, I was advised he had returned to Edmonton and would call me back the following week. The call never came and the deadline came and went. My initial question went unanswered and appears my second question has now been answered. At least sixty (60) days written notice of the holding of any General Meeting shall be sent to all members of the Party who have been members in good standing of the Party for at least fourteen (14) days before the date of such notice. Notice may be given by post or it may consist of transmitting the information of such notice by using appropriate telephonic and or electronic mail to the member’s appropriate information of record and simultaneously posting the information on the Party’s website. Not less than ninety (90) days prior to any Annual General Meeting of the Party, the Executive Committee shall create the Nominating Committee, consisting of three (3) members. It shall be the duty of this committee to nominate candidates for the officer positions to be filled at the Annual General Meeting. Candidates for officer positions and all officers must be members in good standing of the Party. The Nominating Committee shall report to the Executive Committee prior to the notice of the Annual General Meeting being sent to all members, and such report shall be included in the notice of the Annual General Meeting. Nominations may also be made by any member up to sixty-five (65) days prior to the date of the Annual General Meeting, and such nominations shall also be included in the notice of the Annual General Meeting. The 60 days prior to AGM was this past Monday (Sept 24); in my opinion by extending the nomination deadline from Wednesday, Sept 19 to Friday, Sept 21 they really left office staff under the gun to get the proper notice pulled together for Monday the 24th. There indeed was an email notice from the party on Monday, however it didn't include any report from the nominating committee or even the names of those running for the various positions. I've also been watching the party website for updates with a list of names and still nothing has appeared. That leaves regular post (snail mail), unfortunately I've learned through someone who was in contact with the office yesterday that the mailer at best "might" be ready to go out today (Wednesday) - rendering it least two full days late. Let me be crystal clear here, I don't believe this is any fault of the staff or the appointed Nominating Committee. The failures here fall squarely in the lap of the Executive Board and the Executive Director. The Board didn't do it's due diligence of checking the dates. The Executive Director also didn't verify or if he did, he failed to bring it to the boards' attention. An oversight like this may seem minor to some, but if we blatantly ignore our constitution why do we have one? What else has been or will be ignored? If the constitution isn't working then we need to change it accordingly and following the correct procedure to make those changes. The board is elected with the expectation they will uphold the constitution, not ignore or abuse it. What this has really impacted is the democratic process. A number of people are running for the various positions and our members don't even know it!! Each day that passes is to the advantage of the incumbents who are free to communicate to members via their current role. Leaving the challengers as unknowns. The constitution allows for 60 days notice of this information for a reason - - for members have time to educate themselves on all the individuals running. My husband (Cory) feared the notice was going to be delayed and to his credit he took it upon himself to gather the information on who might be running. So while you won't find a list of candidates on the Party website, you can find it on Cory's blog. The names in italics are rumored only at this point. The others have confirmed directly with him. Mere hours after my blog post gets published, the Party has now posted the list of those who are running for the various positions. I called the office and asked if a mailer has gone out. No, it has not. I asked if it would be going out today? No, there is no notice scheduled to be mailed today. Did they know when it would be going out? No, they would have to check with Jonathon Wescott if there was even going to be one. HUH?? Our constitution is pretty clear about the means of notice. Not every member has email, not every member uses the internet. Why no mailer? Are we short on funds? Short on organizational skills? Neither scenario allow the Executive Director or the Provincial Board to overstep and ignore the constitution. If funding is the issue, I can see perhaps tailoring the mailing to go only to those who wouldn't get the email notice. Realistically though you should mail all members, even expired ones, to get them reengaged. At 5:20 PM I received an email from the Party which included the link to the list nominees that they now have online. Makes one wonder if my blog might have prompted this finally going out. Perhaps there is hope for an actual mail-out as well. Those who know my husband Cory from his online presence of his Ranting and Raving blog, Twitter and the occasional appearance on Sun News Network; often are surprised or remark to me, "You're married to that guy?" Our real life friends of course get to see our relationship up close and witness how much we can disagree on things from politics to poker. Without a doubt, it can be challenging at times when we are on different sides of an issue. However it's never boring and that is one thing he promised me; life with him would never be boring. So a few weeks ago, when he decided he was going to speak out and take the Wildrose Party to task on a few things; I had one of those "oh crap" moments. Both of us have been closely tied to the Party, even before it became the Wildrose. In fact this past summer was the first summer since 2005 that neither of us were sitting on the Provincial Executive Board. We have both dedicated countless hours; held our tongues (and noses) through a lot of goings-on within the party. The Party and its' success mean a LOT to us and we truly believe it's founding principles can guide Alberta to a better future. So why would either of us be critical or call into question our own party - - simple, you need to speak up for what you believe in. You need to call people out when they have gone too far and are going the wrong direction. In July Cory started to shed light on some of the concerns. Concerns that likely others shared, but were either unwilling or had no way of vocalizing. Concerns like; the Party building trust, or confronting the confusion over the date for the Party AGM, and digging up the fact that the current Executive barely met since being elected in June 2011 and during an election year. Others started to question his motives and he addressed that. By the end of August he called them out once again on the date of the AGM, cobbling together information garnered from random Twitter messages, because nothing had been released officially on the Party website. Low and behold the next day (and after 5 weeks of prodding) the Party sent out an email and dialed all the members regarding the upcoming AGM. When we returned from an extra long, long-weekend Cory broke the bad news part of the AGM details. Here is an excerpt, to save you some reading and save me typing. On the party website is a link to an application form for executive positions. This is a very deep and intensive application form and it demands right in the beginning that it be filled out completely. Sorry folks, the party is in no place to make such demands. As per the constitution the applicant only needs to demonstrate that they are a member in good standing of the party. Now at the bottom of the form it demands that applicants sign off their party rights to the nominating committee (whoever they are) who may refuse the application for any reason that they may see fit. Sorry folks but that is simply horseshit on many levels. So candidates are expected to sign off authority to an un-named and appointed committee who may reject their application for any reason that fits their fancy. Think about that. If this application is to be believed, authority within the party rests with an appointed committee as opposed to the membership as the constitution states. Around this same time I decided to get involved. Something neither of us normally do, we tend to let each other go off and do their own thing. I prefer going to the source for information and thoroughly enjoy research and fitting pieces of a puzzle together. This is one area where Cory and I differ; he can be seen as browbeating at times, I like a more methodical approach. First I emailed Jeff Trynchy at Party head office (he is always very helpful) and asked him who was on the Nominating Committee. Keep in mind that in 2011 this committee had their names published on the party website well before the deadline to apply to be a candidate. The timing of appointing this committee is crucial. It must be done at least 90 days prior to the AGM (as per our constitution). This means they had to have been appointed by August 23rd. However earlier is by far more preferable given they are tasked with ensuring there are candidates to run for all 16 positions. At 65 days prior to the AGM they must report to the Executive Committee all the names of nominees. As you can see if they leave appointing of the committee until 90 days, that only gives the committee 25 days to find people, to communicate to the constituencies and the members at large. More than a week past I hadn't received a reply from Jeff (this is unusual). I then forwarded the same email to Paul Collins (President) and Jonathon Wescott (our new Executive Director) and re-asked who was on the committee and added a question about the crazy clause. I pointed out that our Leader, Danielle Smith had publicly stated that this concern should be addressed by the Executive. When I didn't get a reply from either of them, I then sent an email to the entire board. I also sent it to a group email address for all of the Constituency Association Presidents. To my surprise I got this automated reply: "Your email is being held until the list moderator can review it for approval." I understand it's meant to deter spam and frivolous emails, but it didn't deter my inner-bulldog (lol), as I set about sending it to every public CA address. THANKFULLY, a board member did reply early Sunday and gave me the names of individuals that they believed to be on the committee. Specifically; Rob Ladoucer (VP of Policy), Doug Main and David Chatters. Since then I've received three more confirmations of these names, though one was an anonymous email. I asked Rob on Twitter to confirm, so far I haven't heard from him. He would have also received my email. I understand that you may be on the Wildrose Nominating Committee for the upcoming AGM. Can you verify this? If so, I have a couple of questions for you. Thank you for the quick response Doug. Last year the party had released the names on the committee well before the AGM, this year it seems a bit challenging to find this information. I will preface my questions with the fact that I’m not personally seeking a position. Who else is on the committee and when were you appointed? 1.) Acknowledge and agree that the AGM Nominating Committee has the authority to disallow my candidacy on any grounds it sees fit, and whose decision shall be final and binding and not further appealed or challenged. Did the committee or the Provincial Board come up with this clause? Isn’t this counter to our grassroots? What was the intent in having applicants agree to this? And lastly, are there other ways to get your name on the ballot without going through the application process? I'm sorry I can't answer any of your questions since I was only recently asked if my name could be put forward for this committee and we haven't had any meetings or discussions yet. Perhaps see Jeff Trynchy for your answers. Actually I asked Jeff already a couple of weeks ago, he didn’t have any answers. That was Aug 29th, so maybe you hadn’t been approached yet. So you don’t know who else is on the committee or who might call a meeting? I didn't have David Chatters email, but I was able to find his phone number and I called him Sunday evening. I confirmed he is on the committee. I asked him if he could verify the clause "...committee has the authority to disallow my candidacy on any grounds it sees fit". Me: Can you tell me why the committee put that stipulation in there? 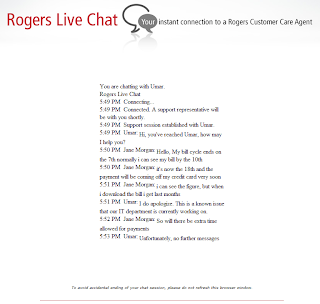 Mr Chatters: No. I don’t, actually….. because I was asked to sit on the committee and I said I would. And the committee hasn't even met to go over the rules or anything. So I really don’t know who drafted that. Or why they would. Me: It's very disconcerting to me because it does go on to say the decision would be final and binding. And that you wouldn't be able to appeal or challenge it. As I understand it the committee is made up of three people, is that correct? Mr. Chatters: Yeah, that's what I understand as well. I don't ... I assume that the current board and the Executive Director put in place those rules. I don't know, it sounds kind of high-handed me. I don't know why they would have to put something like that in. It doesn't make any sense to me and everything should be appeal-able. Me: Right. And our constitution when it speaks to running for an Executive position it says you need to be a member in good standing. And it doesn't really say much more than that. But this makes is sound like this committee, these three people have the ability to prevent someone from potentially running. And really, in my eyes, I mean it should be up to the members to decide. Mr. Chatters: Yeah, I would think so......I, I don't know ..... I know that Collins the former, or the current President ........ he's not running again so he is sitting on it and I'm sitting on it. And I think the other one is Rob Ladouceur; who is policy director and is not running again. I think if you have questions like that you should perhaps talk to the Executive Director. At least until the committee has a meeting and has a chance to discuss these things. Mr. Chatters went on to say that he was appointed about a month and a half ago and only communication he has had since is an email he got about three weeks ago. In it he was advised he would be receiving applications by mail to review. So far he hasn't gotten anything. He said at this point even if he did get them, he's not sure how he would review them without knowing the rules. Mr. Chatters: So I'm pretty much in the dark, like you. Me: I have sent an email to the Executive Director, but I haven't gotten a reply as yet. Mr. Chatters: I'm expecting to get something and I'm expecting the committee will have at least a conference call meeting to go over the rules and what the criteria are and why would we object to someone running. You know all of those things we should go over it as a committee. Mr. Chatters: I don't know where these rules came from. They sound a little dictatorial to me for a grassroots, democratic, party. At this point I do want to be very clear; Doug Main and David Chatters are both very well respected in political circles and beyond. They have both served on committees with the Wildrose Party previously and Doug in other capacities as well. I have never had any concerns with respect to either of them. Clearly neither of them had anything to do with writing the clauses on the application form. I also doubt they were provided with much information as to what is entailed on this committee. Things such as the timelines. By my calculations 65 days prior to the AGM lands on September 18 or 19 depending if you count the Friday of the AGM; not September 21 as stated on the Wildrose application form. That gives them a mere ten days. Then the countdown starts to get notice to members of who is running, which needs to be post-marked by September 24 (60 day mark). However there are bigger questions than logistics surrounding this issue. Who wrote that clause? Was it the Executive Director, the board, a staff member? If it was staff or the ED, did the board agree to it? If they didn't approve it, how did it get as far as it has? It's in writing and posted on the website, so clearly appears to be a party sanctioned document that is in direct violation of our constitution. Another aspect of this that doesn't sit well with me is current board members being on the nomination committee. We are a party of 25 K + members and we can't find three members completely removed from the executive??!!! Some will say it's not that big of a deal if neither Rob Ladouceur or Paul Collins are running again. Do we know that for sure? Rob very recently started a brand new blog with a subtitle "Wildrose VP Policy's Blog" Why would someone do that 15 months after they were elected to the role and they know they only have less than 90 days left? I had heard Paul Collins actually did step down in the summer and they had even found a replacement, but someone in caucus didn't like the replacement and convinced Paul to stay on. I believe this rumor is supported by the fact that when David Chatters was contacted a month and a half ago he was told Paul had stepped down. Thus him thinking the three committee members are Collins, Ladouceur and himself. Whereas we have Doug Main who, in his words, "was only recently asked" to be on the committee. I think the committee was in place sometime in July with Collins, Ladouceur and Chatters. Then Collins is convinced to stay on has a change of heart (when, we don't know), his spot is then filled (recently) by Doug Main. Normally I wouldn't purposely draw negative attention to the Wildrose. However the Party we joined, the Party we helped build, the Party we believe in; wouldn't normally so publicly and blatantly, violate our member endorsed constitution. Wildrose; I'm calling your bluff. Pull that application in its' entirety. It's a disgrace to what we stand for, what we built and what we dream of for our province. I have now heard back from both Paul Collins and Jonathon Wescott. Unfortunately their answers were incomplete and generated further questions on my part. Both promised to get back to me later today with additional information. I've also had an email exchange with Rob Ladouceur, confirming he is on the committee. He also confirmed the EC passed a motion regarding the nominating committee and related clauses. "This year's application uses strong language partly because the motion from the EC is also stronger in language." "The motion was specific in saying that disqualification can only happen if someone could damage the party's reputation." "if someone "could" damage the party's reputation". Could. May. Might. Perhaps. Really? How does one determine that? Is it someone with a criminal record? Is it a member who is openly critical of the party? Is it someone who wears different colored socks? Is this committee expected to be able to predict the future? To predict the future, specific actions of a person from a review of a written application? We already have mechanisms in place to deal with individuals when they "actually" damage the party's reputation. If you ask me the party's reputation has already been damaged by a board that is violating our constitution. No committee "could" have seen that coming 15 months ago !!! As mentioned previously, both Jonathon and Paul agreed to get back to me later today. I have received an email from Jonathon and given the contents, I suspect I won't hear any further from Paul today. By way of short update, I have a meeting scheduled to receive instructions and discuss your email, but it is later this evening, therefore, if I am not back to you this evening, it will be tomorrow am. I am of course very hopeful that common sense (IE: follow our constitution) will prevail at this meeting. And that the offensive clause on the application will be removed. Or better yet, the entire document; all they need to know is if the person is a member in good standing. It's now just past noon and no word from Jonathon Wescott; however it has been brought to my attention that the clause on the application form has been changed. Also there is a memo from the Nomination Committee as a result of their first meeting of last evening. It's excellent that there has finally been action on this. I am particularly pleased that they have outlined the second way to nominated and provided a form for convenience. It would appear there is still some confusion over the cutoff date. As I previously mentioned, 65 days prior to AGM falls on September 19, not the 21st. as indicated on the Wildrose website. I am looking forward to getting a response from Paul Collins, current President of the Wildrose Party; to clarify his comment left on this blog earlier today. (See below).